My mom says she'll help me do it, I think some of the dolls will probably be on the bed, leaning on me. And I'll be holding several. Well, we will see, if it works, I'll post a picture of it here for sure! Oh there are some lovely photos! When I get some time I will try and take some of my girls in my hand too! Thank you for sharing everyone! That's such a great idea of all your dolls covering you, using them as a blanket or such? hehe! Sounds difficult so if you manage to do that, either of you or both, that'll be an accomplishment and I'd love to see those photos! You should def do that ! 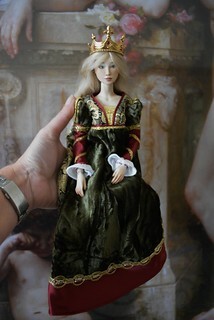 A really quick snapshot of doll in hand!! Miroslava, by SisterFox being a little 'Princess'!! Omg!!! Omg!! This is My fav pic! Where did you get that beautiful dress dear? She looks like a fairytale princess! I love that photo of Arya in your hand, Els, I love her pose! Bibarina, what a lovely photo, she is a real princess! I have been thinking about looking into some barbie dresses too, some are really very pretty! Hi Nordicfairies- No, it is not one of a kind- it's from one of the collector editions! What size is your doll? Wow, what a smart idea to make thread lied this and see doll pictures with their masters. I will add some pictures to this lively thread. Here is my dolls in my hand, and pictures from last International doll show in Ashville NC. It was wonderful time, yes!! !